widget | Do You Have A Pencil? 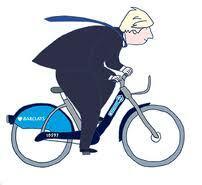 Just a week after launch, 20,000 eager Londoners have decided to give “Boris’ Bikes” a peddle. Like any major public-facing initiative, the first 48-hours didn’t escape hiccups or questions of concern (helmets anyone?) but a week out, the majority of the Zone 1’s and 2’s are quite happy to give it a go. It’s predicted we’re well on our way to 30,000 early adopters, but what’s really going to give this program er…legs will be it’s low-no barrier for entry (membership fees aside) but physical ease of use. Nobody wants to shell out 40 quid to clunk to work on a bike from the Cold War. Recognizing the opportunity necessity for online compatibility, the Boris camp have been hard at work leveraging @mayoroflondon and @barclayscycle to promote links and information using an easy to remember #cyclehire hashtag. They’ve also promoted opensourcing of TFL data so that developers like Android’s Little Fluffy Toys can (already have) build smart phone widgets. And while social media can’t physically help you fix a sudden flat tire or dart in and out of the crazy No. 7 to Russell Square, it just might help you get there on time and in one piece. Follow the journey of one bike here.